ECOLINE+ reciprocating compressor series wins UK award. Last month, UK-based ACR News magazine presented BITZER with the most innovative refrigeration technology product of the year award for its ECOLINE+ compressors. The transcritical CO2 compressors used in supermarket applications were first presented at Chillventa 2016. 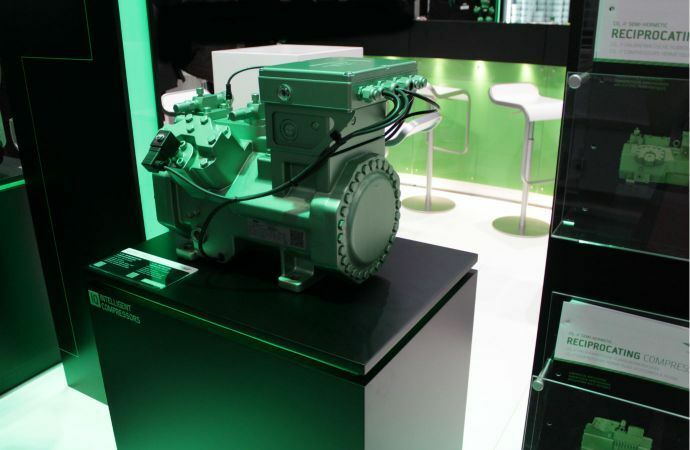 “ECOLINE+ is the most efficient CO2 compressor available in the market today,” said Gianni Parlanti, Bitzer’s chief sales and marketing officer, in a press release. The company also launched a new four-cylinder reciprocating compressor at EuroShop, which offers optimal efficiency both for full- and part-load and is easy to integrate into refrigeration systems. It is equipped with new line-start permanent magnet motors (LSPM), an enhanced motor technology that forges ahead into better efficiency ranges. The mechanical capacity control for transcritical CO2 applications is also new, which enables systems to go without frequency inverters. The ECOLINE+ series enhanced line-start permanent magnet motor also increases annual performance figures by more than 10%. The CRII mechanical capacity control allows ECOLINE+ reciprocating compressors “with a cooling capacity of between 10 and 100% almost continuously,” Kevin Glass, managing director at Bitzer UK and new president of the UK’s Institute of Refrigeration (IOR), told R744.com at EuroShop last year. Next Article: How Much Weight Can Rack System Hold?